Shelter reservations are accepted beginning early in January. Full payment must be made to reserve a shelter. No refunds after May 1. Sun decks may be reserved for a full day, with an optional food package and pop-up sun canopy. Each deck has a 12 person capacity, including as many as 6 adults. Early (11:15 AM) admission is available for those with deck reservations. The Waterpark is also available for private events. Call Parks & Recreation for rental details. C.T. 's Party Room offers a variety of Party Packages for birthday parties or other celebrations. All shelters are close to restrooms and running water. When can I rent a shelter? Can I reserve a room in the Township Municipal Center? From hot dogs or hamburgers to filet mignon, we can handle it all! Cranberry Highlands. Catering packages include food preparation, presentation, place settings, plus clean up. Allow us to handle the details while you enjoy your family and guests! 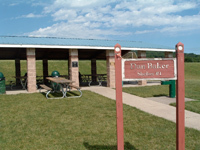 Contact: Cranberry Highlands Golf Course: 724-776-7372, x1214. * Field permits are required for organized play. * Pets are permitted only in the Rotary Dog Park. * Alcohol permitted by PERMIT ONLY at our shelters in Community & North Boundary Parks. * Off-road vehicles are not permitted. * Skateboarding is permitted only in the AE Ride Skate Park behind the Municipal Center. * Parks and/or fields may be closed due to weather conditions. * Please review the complete rules guiding the safe use of our Parks.